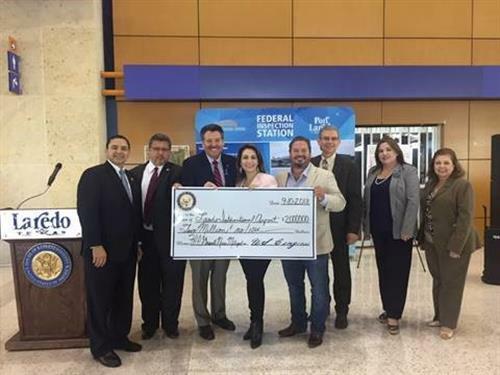 Congressman Henry Cuellar (D-TX-28) today announced the awarding of $2 million in federal funds from the Federal Aviation Administration (FAA) Airport Improvement Program to the Laredo International Airport. The FAA grant will be used to help finance the airport’s ongoing efforts to reduce noise for those living near the airport. As the Laredo International Airport continues to grow, a higher volume of air traffic has contributed to noise for residents in the surrounding neighborhoods. The noise program, which began in 1994, allows homeowners within the designated noise area to choose between three mitigation options. The program permits the airport to acquire the property, purchase an easement (at eight percent of the appraised value of the property), or insulate the home. The funds announced today will allow the airport to implement noise mitigation measures in the residential area adjacent to the airport by providing sound insulation to residences within 65-69 Day-Night Average Sound Level (DNL), a noise metric used by FAA to measure effect of noise on residential populations over a 24-hour period. Furthermore, it will be used to analyze the existing Noise Exposure Maps (NEMs), study conditions, aviation demands, and prepare an update on the NEMs for future conditions for the next 5 years thru 2024. This will provide sound insulation for 6 residences; enable the purchase of 16 residences and the acquisition of avigation easements of 5 residences. The City of Laredo will add $222,223 in matching funds for a total investment of $2.2 million. The City anticipates that this grant will help reduce noise complaints for approximately 108 residents, or 27 homes. To date this year, Congressman Cuellar has secured over $13 million in federal funding from the FAA to address aircraft noise for 264 homes near the Laredo International Airport. Over the last 25 years the airport has received over $238.5 million dollars in federal funding. To see map of AIP noise lands, click here. Congressman Cuellar and representatives from the City of Laredo on Monday announce a $2 million grant from the Federal Aviation Administration to the Laredo International Airport to help nearby residents with air traffic noise. Pictured from left to right are Congressman Henry Cuellar, Laredo City Manager Horacio de Leon, Laredo Mayor Pete Saenz, District 5 Councilwoman Nelly Vielma, District 6 Mayor Pro Tempore Charlie San Miguel, Executive Director of Transportation Mario Maldonado, Assistant Airport Director Elsy Borgstedt, and Deputy City Manager Cynthia Collazo.